Photography workshop Winter in Korouma. Part of Koroma's distinctive nature are the cliffs both sides of it, where several streams freeze during the winter forming large ice formations. Ice formations are one of the most exciting things to photograph in the area. You cannot find that kind of ice falls anywhere else in Finland. There is five large ice falls height from 40m to 60m. Brown River is Korouma's largest and highest icefall. WHERE AND HOW TO DO THE PHOTOGRAPHING IN KOROUMA? Korouoma is about 5km from my childhood home, and I have been there countless times. I had this idea of shooting ice fall pictures at night in my mind for a while. It was a super cold night - 38°c degrees and bright moonlight night. Canyon drops from the ground level, so it’s even colder in the canyon. Once you have right winter gear and enough spare batteries cold is not an issue. Surely it makes your actions slower and even bit painful when adjusting camera setting, but it’s not so bad in the end. There is about 900m walk from the Saukkovaara parking area into the bottom of the canyon. The place is a popular hiking area, there are marked routes, and usually, the trail is open during the whole winter. At the bottom of the canyon, there are two lean-to shelters and campfire sites. I arrived at the bottom of the canyon before dark. First, I made fire; it makes the waiting game so much more comfortable. 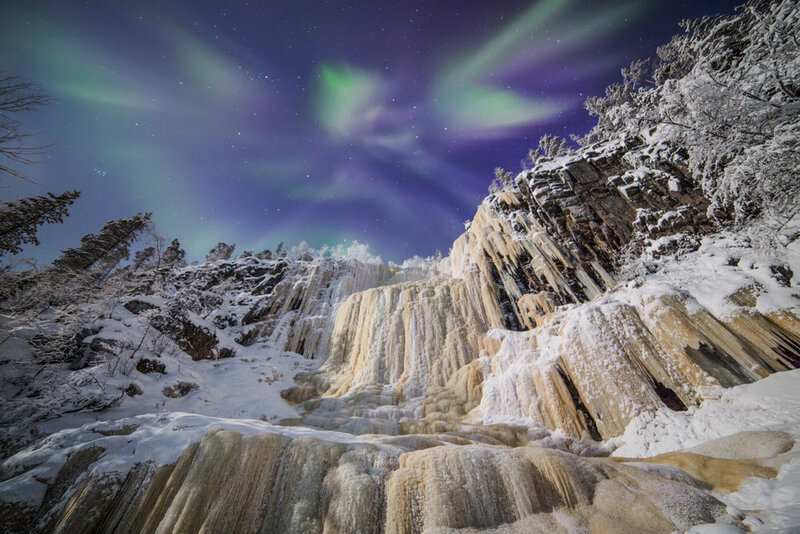 I wanted to shoot Ice falls under the moonlight, but once auroras came visible, I got excited. Could I get auroras and the Icefall in the same picture? Fireplace at the bottom of the canyon. Temperature - 41°C . 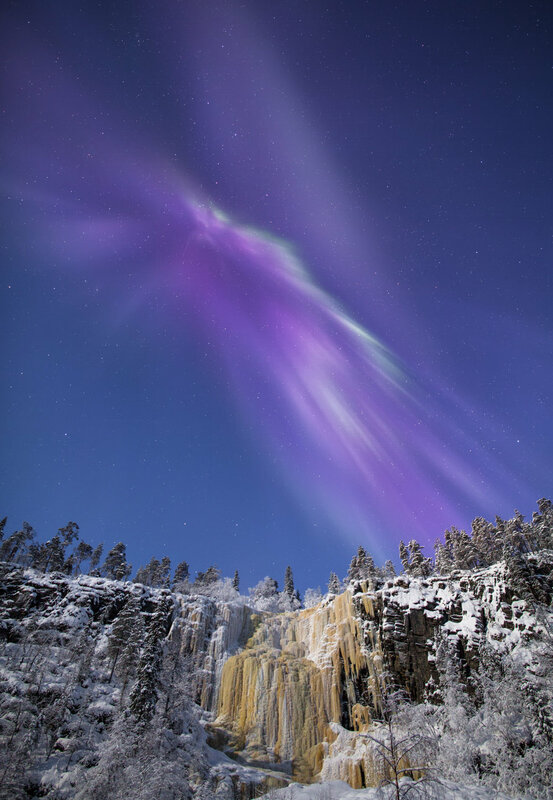 Auroras dancing above the trees in the Korouoma canyon. From the fireplace, the largest ice fall is only 300m away. Just a few minutes of walk, but ascending to the bottom of the icefall takes another 15mins of sweat. Once I arrived from the woods to open space, I saw the auroras dancing above the ice-fall. It was more than I expected. I spent about 5 hours in the canyon. First auroras appeared at 17:30 and I saw last auroras at about 20:00. Operating in such cold conditions was worth it. I took about 290 long exposure frames, and I run all my five camera batteries empty. The cold has affected battery life; even you keep all of them in warm pocked. All pictures shot with Canon 5Dmk3. The camera was otherwise working good, but once in a while, it could not process preview images at all. After finishing the photography workshop, it was time to go home and have a warm sauna. Once I arrived at the car I was laughing out loud once saw my frosty look in the mirror. I felt some hair went out from the powder mask but did not expect the gnome-look. The trail is easy but going back, it's all up hill. 5 hours in - 41°C degrees. Frosty!!! If you go alone, tell someone your plan and when you should be back because phones are not working in the canyon. If you go alone, take a winter sleeping back with you just in case if something happens like you broke your ankle, etc. and you can't hike back to a car. Help might take a long time, and you don't want to freeze. At the day time there are usually people coming and going, but at night you might be the only one in the area.